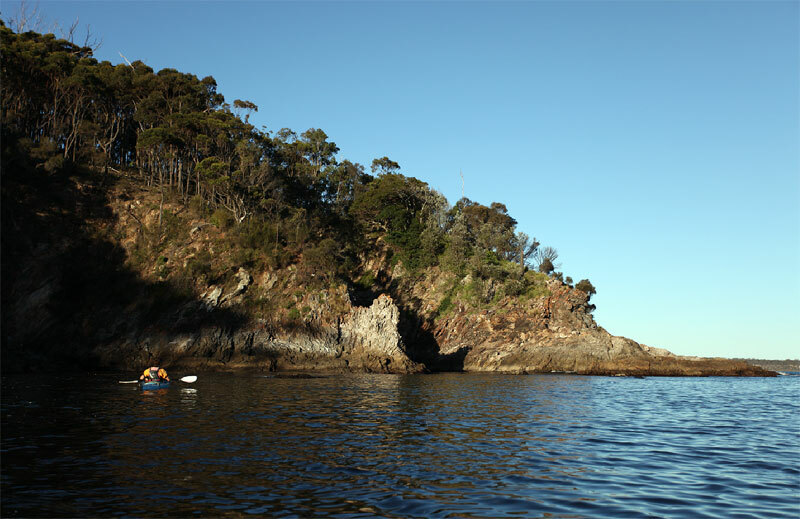 You don’t have to go far to sit in a kayak and paddle around but Solveig Walkling discovered why making the trip down to Batemans Bay for a paddle is well worth the effort. When our editor decided to send me on a trip to Eurobodalla, the “land of many waters”, as local Aborigines call it, I could hardly locate the region on a map. Names like Nelligen, Broulee and Mogo didn’t ring a bell either and I decided to fly blind on this first trip beyond the greater Sydney region’s Southern border. 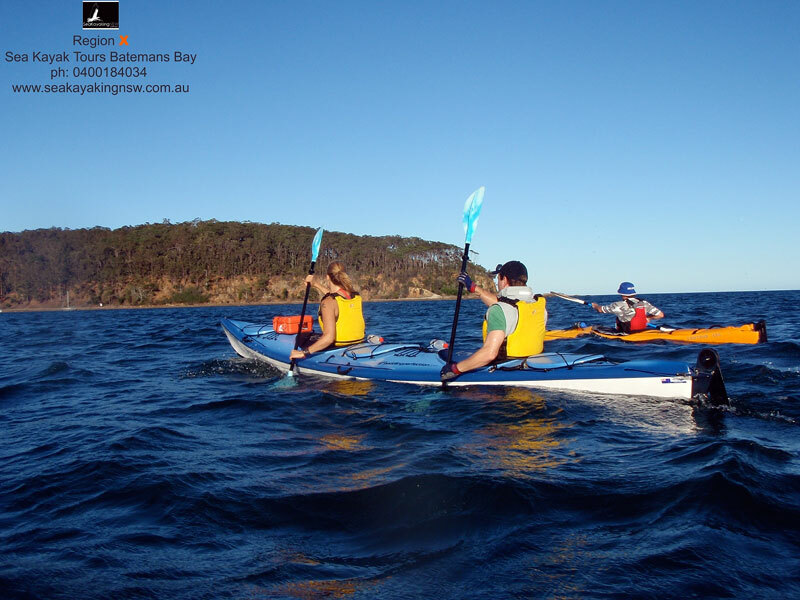 The only activity I had planned was a kayaking trip down at Batemans Bay. Of course, you don’t have to go all the way to the South Coast to get paddling. 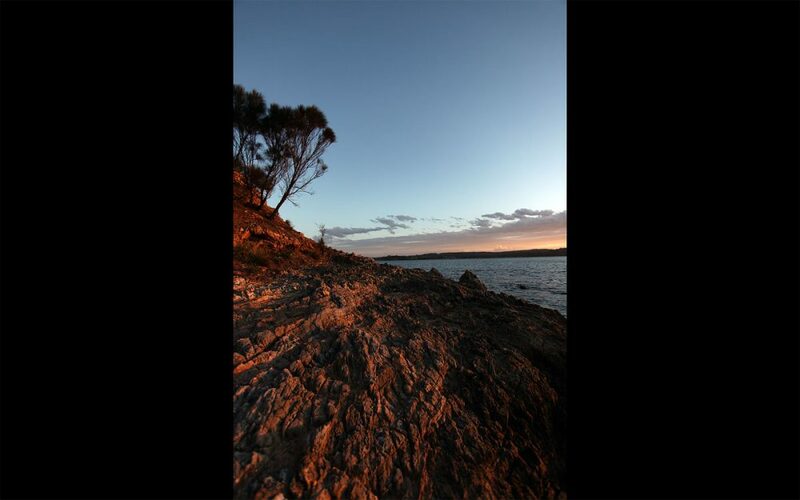 There are plenty of places around Sydney like, for example, the kayak hire at La Perouse. For about the same price as two tickets to the movies, you can paddle to your heart’s content around the murky foreshore and watch containerships in the distance. But don’t venture to far off, as the attendants will come after you in a motor boat, effectively stopping you from venturing anywhere slightly interesting or picturesque. As Josh Waterson from Region X Kayak in Batemans Bay explains to me, it can be difficult to hire out kayaks due to liability issues and the folks in Perouse might not be allowed to let punters out of their sight. It’s a nice explanation for one of the most boring kayaks I have ever experienced and in total contrast to the sunset dinner cruise on the Clyde River that Josh has organised. As we set out between sailing boats and leave the shoreline with fishermen and playing children right near the bridge behind us, I remember why I love kayaking. The rhythmic dipping of the paddles, sliding them through the water and the unusual view from right near the waterways’ surface totally relaxes me and is an easy way to reconnect with the great outdoors and explore a region known for its waterways. And we couldn’t have found a better guide for our late kayak. Josh travelled the world for twelve years as a kayaking guide before settling down at Batemans Bay with his wife and now two-year-old daughter. He’s passionate about his job and explains the area’s history, our natural surroundings and passing wildlife. His dedication and love for the job is evidenced by the fact that his little daughter likes pretending to play telephone just as much as any other toddler, only she pretends she’s talking to “daddy’s clients”. We are lucky on our cruise, as one of Josh’s guides happens to come along for an evening paddle as well. The laid-back Shane regales us with his tales and picks up where Josh leaves off. Between paddling up the river into the bay, looking for stingrays in the shallows and marvelling at a cave only accessible from the water, time flies. Soon, we arrive at our landing spot on a deserted beach. Josh whips out an amazing three course dinner before we’ve even had time to venture far on our search for abalone and investigation of the intriguing rock formations that would have my geologist friend in tears (and make a nice picture opportunity for a travel writer oblivious to their rarity). 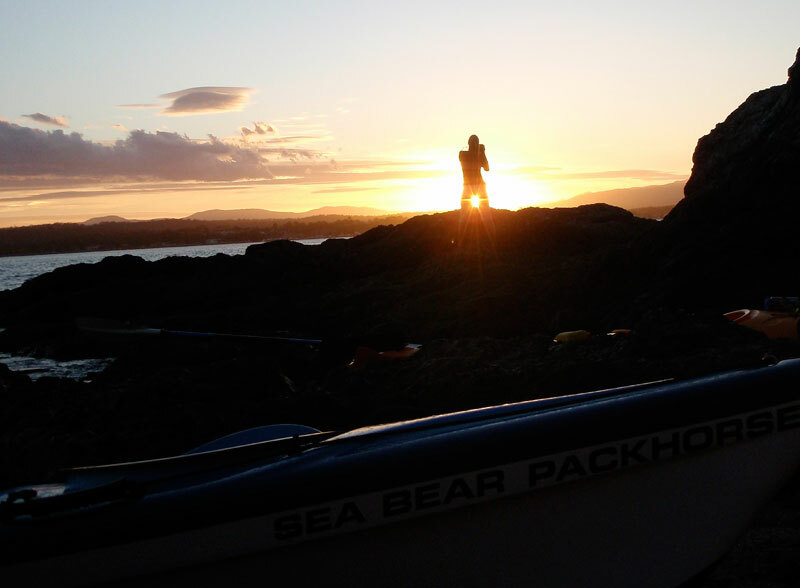 Our dinner is taken on the rocks with not a soul in sight and sweeping views of the sunset. A sea eagle soars overhead and Josh tells us how he once saw two mating eagles soaring up higher and higher diving down in circles kamikaze-style. He also produces a rather uncanny imitation of various bird sounds more real and entertaining than another bird loving guide’s recordings which I was treated to on a recent trip down to the Eyre Peninsula. A little alcohol-free champagne later – we will be steering a moving vessel in the dark after all -, it’s time to leave the secluded spot and make our way back up the river. The night sky slowly comes to life with twinkling stars and the lights of the town lead our way in the distance. Josh and Shane shorten the trip with more stories about the town and its development and Josh’s travels around the world. Sated and a little tired even, we arrive safely at our landing site, and before long it’s time to say goodbye to Josh and Shane. I pledge to come back for one of Josh’s longer trips down the coast to Narooma with an overnight camp. 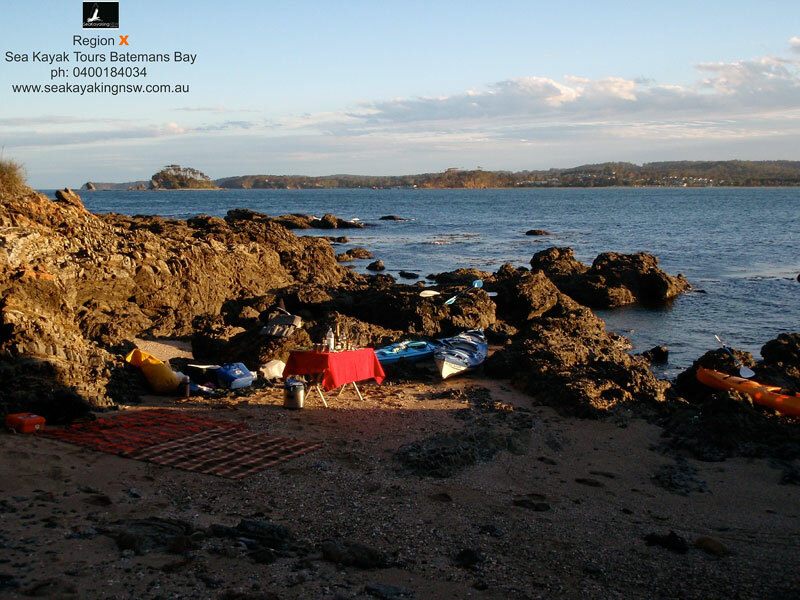 It’s been one of the best kayak trips I’ve had and well worth the journey down to Batemans Bay. With a lunch stop at Berry and an overnight stay at recently refurbished Murramarang National Park Resort, I have only just got a taste for the area. They say Sydneysiders are split into two groups, those of us who migrate North in winter, in search of relief from the buzz of the big smoke, yearning warmer weather and waters, and those who travel down the South Coast, seemingly for no apparent reason other than that it is more deserted. Sometimes, a change of direction is all that’s needed to shake things up. Anyone up for a winter kayak? Evening Eco Tours including dinner last 4 hours and cost $99 per person. 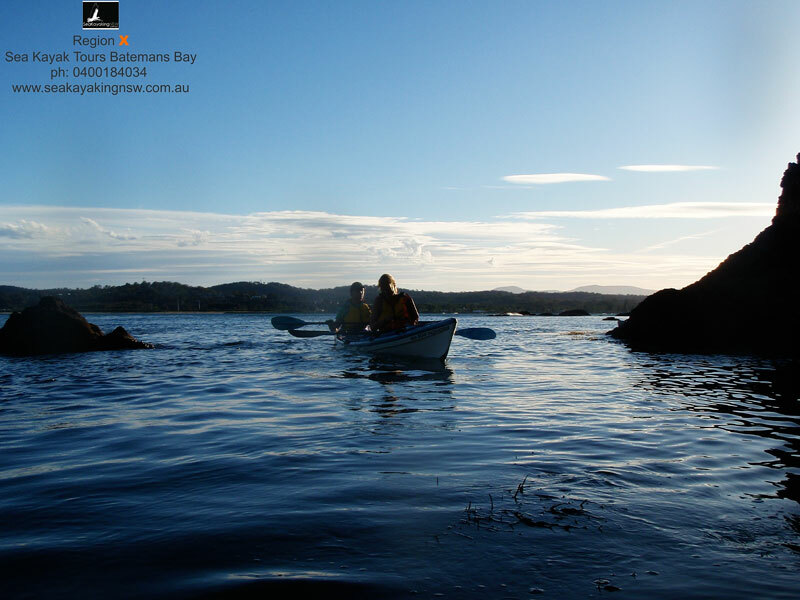 For more information, head to www.seakayakingnsw.com.au or call Josh on 0400 184 034. 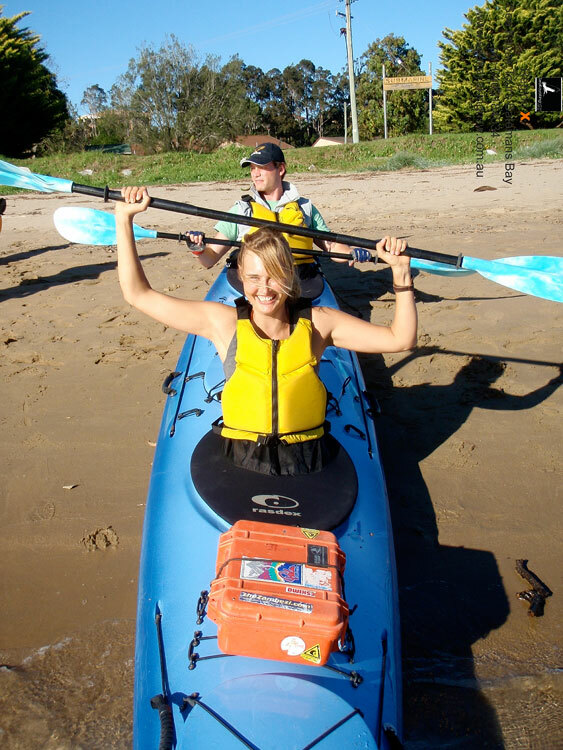 For this online article, AT’s Solveig Walkling travelled courtesy of Eurobodalla Tourism. 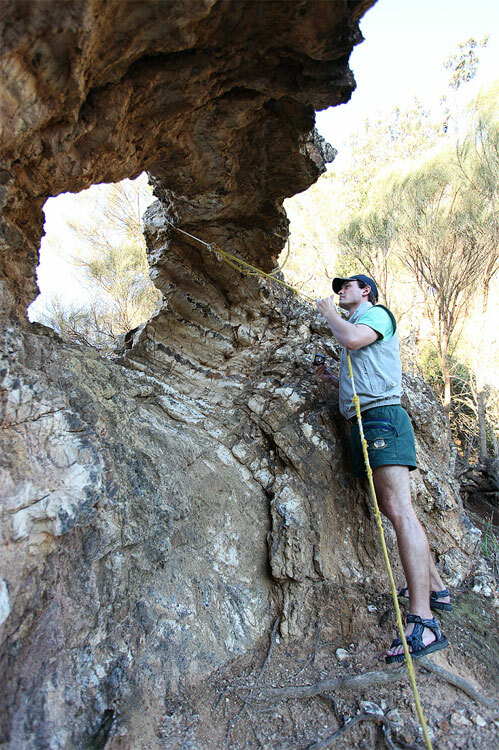 For more on the region, also check out our article on Montague Island.